The Medal of the Immaculate Conception, commonly called the Miraculous Medal, was given to Sister (now Saint) Catherine Laboure, in France. 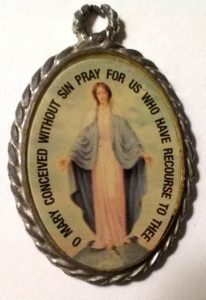 In 1830, she was blessed with seeing (called an apparition) the Blessed Virgin Mary (Jesus’ mother), who asked her to have a medal made. The image above is a picture of the Miraculous Medal that Anna wore. Sister Catherine’s description of Our Lady: “Her feet rested on a white globe…I saw rings on her fingers…each ring was set with gems…the larger gems emitted greater rays than the smaller gems…I could not express…the beauty and the brilliance of the dazzling rays.” St. Catherine heard an interior voice: “These rays symbolize the graces I shed upon those who ask for them. The gems from which rays do not fall are the graces for which souls forget to ask”. An oval frame formed around the Blessed Virgin, and within it were the words: “O Mary, conceived without sin, pray for us who have recourse to you”. The voice spoke again: “Have a Medal struck after this model. All who wear it will receive great graces; they should wear it around the neck. Graces will abound for persons who wear it with confidence.” When Jesus’ mother, the Blessed Virgin Mary, gave the design of the medal to St. Catherine, she said “Now it must be given to the whole world and to every person.” The Medal was made according to the Blessed Virgin’s design. It was given out freely. Almost immediately blessings promised by the Mother of God began to shower down on those who wore her Medal. Marvels of grace, health, peace and blessings followed for those who wore the medal, which then became known as the Miraculous Medal. Would you like me to send you a free Miraculous Medal (USA addresses only)? Again, as with the rosaries, the medals are donated by myself, and are separate from Anna’s Gift. 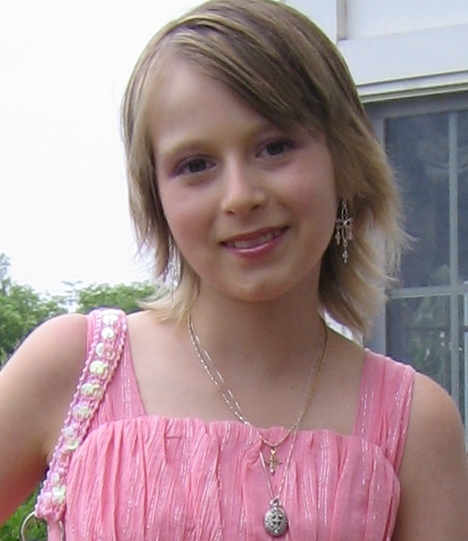 No money donated to Anna’s Gift are used in anyway for any purpose associated with the Miraculous Medals.